around senior washboard bands, listening to the 60s/70s oldies on the radio, and watching Hee Haw, American Bandstand, and Soul Train. Now and then, she had to attend loud parties of Arabic speakers with her family and clapped along with the music while rolling her eyes while men threw dollar bills at the hired belly dancer. While straddling the two very different cultures, Lisa sought solace in LPs, radio, and cassettes while wandering off singing outside and making up songs. When Lisa was six years old, she received a plastic Dukes of Hazzard guitar and wanted so desperately to learn how to play it but didn't have anyone to show her. She then took to playing harmonica since she could teach herself, but her siblings admonished her from practicing in their vicinity. It wasn't until after her travels up and down the East Coast and hanging out with punks, poets, hippies, and rock & rollers that she finally learned how to play guitar, starting with the blues because she had them...and she had them bad. Her self-taught guitar skills collided with her nomadic stories, and her songs were born. After playing bass and guitar in various bands — art rock, garage rock, girl pop-punk trio, and a metal band, she always wrote her personal songs on the sides. 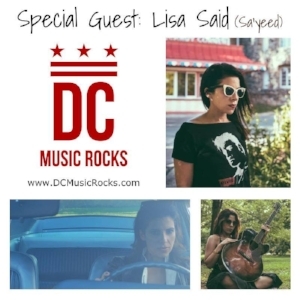 Now living in DC, she began recording her solo songs in 2014 with the help of Jim Ebert at Cue Recording Studio and then Don Zientara at Inner Ear Studio in Arlington, VA.
With an affinity for early 70s music, classic country, and North African percussion, she wants to evoke the poets and bards that have accompanied her through her journey. Her music reflects an intersection of folk, rock, & country with a Middle Eastern tinge and pop sensibility. June 2018 interview with Nina Goodman for DC MUSIC REVIEW: "Performing 6/2 At The All-Female Led Radiohead Tribute/Benefit Show"